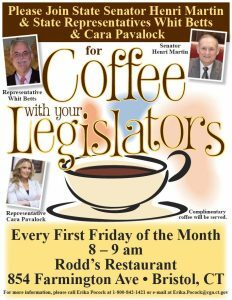 Bristol – State Reps. Whit Betts (R-78) and Cara Pavalock D’Amato (R-77), and State Sen. Henri Martin (R-31) invite Bristol residents to join them for their monthly Coffee Hour event on Friday, November 2 at Rodd’s Restaurant (854 Farmington Ave., Bristol). The public is invited for coffee and conversation from 8:00 a.m. to 9:00 a.m. to meet with their legislators in a relaxed setting and hear the latest updates from the State Capitol. Those unable to attend the event but would like to discuss any concerns may contact Betts and Pavalock-D’Amato at 800-842-1423 and Martin at 860-240-0022.